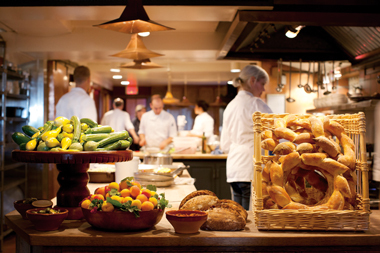 Guests of Chez Panisse have a unique view of the kitchen as their meal is prepared. Editor's note: Alice Waters will receive the Foundation Medal at UC Santa Cruz's Founders Celebration Fiat Fifty dinner on September 26, 2015. 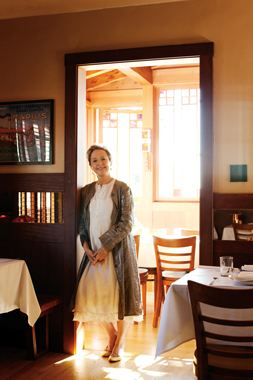 Extra: Read our Q&A with Alice Waters. In 1971, Richard Nixon was president of the United States, Vietnam War protesters converged on Washington, D.C., and the New York Times caused a sensation when it published the Pentagon Papers. During that turbulent year, a highly ambitious Francophile and food obsessive named Alice Waters, along with a group of idealistic friends, opened up a tiny restaurant in an Arts and Crafts house along Shattuck Avenue in Berkeley. The restaurant was centered around organic, locally grown food, ecologically sound harvest methods, and environmental stewardship—concepts virtually unheard of at the time. On opening night, Waters wore a used polka-dot rayon dress from a neighborhood boutique called Bizarre Bazaar. She was crouched on the floor, nailing down a carpet, when the first curious diners wandered in. Little did she know that the restaurant would still be thriving more than four decades later—and considered one of the best in the world. From this humble beginning, her restaurant became legendary, while Waters herself soon gained an international reputation—not just as a chef and cookbook author but a spokesperson for sustainable food, unafraid to take controversial positions that have made her critics label her everything from a food zealot to an "absolutist." In advance of her visit to campus, Waters, who will receive the Foundation Medal during UC Santa Cruz's Founders Celebration Fiat Fifty dinner on September 26, spoke candidly with UC Santa Cruz Review about her career as a slow-food advocate, her life as a chef, her fight against the "fast-food nation," and her common cause with the ideas and mission of UC Santa Cruz's pioneering sustainable agriculture program. The UC Santa Cruz Farm, building on the success of UC Santa Cruz's Student Garden Project started by Master Gardener Alan Chadwick, was founded the same year as Chez Panisse. UC Santa Cruz's Center for Agroecology & Sustainable Food Systems (CASFS) offers a popular Apprenticeship in Ecological Horticulture, an intensive organic farming and gardening training program (now in its 48th season) that has "seeded" the organic farming and food industry with a wealth of graduates. Waters once visited with Chadwick himself while he was staying at the Green Gulch Farm near San Francisco. Waters has worked closely with several apprenticeship alumni from the UC Santa Cruz Farm, in both her restaurant as well as her Edible Schoolyard garden, where urban public school students learn to raise their own food. "The UC Santa Cruz program really trains apprentices for farming in a very particular way so they can come and, immediately, become a teacher for young children," she said. Waters also said that farm apprentices, such as the ones in UC Santa Cruz's program, are more important than ever these days because "young people are redefining what it means to be a farmer, and they are bringing us out to the country, and showing us the culture of agriculture." In the process, these hard-working apprentices are building more of a community around farming, she said. "Even in the '60s, organic farmers, if they weren't on a commune, were mom-and-pop operations—hard work, and pretty solitary," she said. "We've never elevated the farmer in this country. We've taken them for granted the same way we've taken our teachers for granted. Let's lift up the farmer and the teacher as the most important jobs of our country." Chez Panisse and other like-minded restaurants have tried to do their part to "lift up the farmer" by listing the names of the farms that raised the food on their menus—a trend that has become so prevalent, it was spoofed on an episode of the satirical television show Portlandia, in which a diner got to meet the chicken he was about to eat. Waters continues to embrace the idea of listing farm names because, in her view, it is a way not just of giving credit to the hard work of growers but forging a relationship built on transparency and honesty between the restaurant and its patrons. Diners, if they wish, could drive out and visit the farms themselves, she said. She also spoke of the similar root systems of her restaurant and the UC Santa Cruz Farm program. "We were really involved with Diet for a Small Planet in the '60s, and there was lots of dropping out (of the industrial food complex, which started in the 1950s) and growing your own," she said. "I felt that was a whole part of the hippie culture. At that time, there was this feeling: whatever you did, people would come and support it. I mean, we stopped the war in Vietnam. We had this strong sense of an idealistic world we could create ourselves." It is that idealism, and that sense of adventure, that unites the mission of Alice Waters with the goals of CASFS, said Daniel Press, CASFS executive director and the Olga T. Griswold Professor of Environmental Studies at UC Santa Cruz. 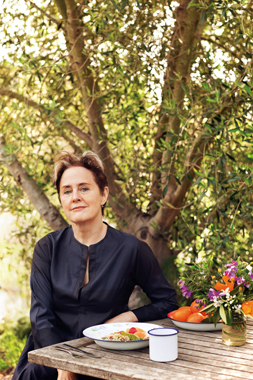 "If CASFS is the mothership of California organic agriculture, Alice Waters is the matriarch of California chefs," Press said. "UC Santa Cruz's Farm & Garden and Chez Panisse both recognized early on the importance of sourcing food locally and establishing strong connections between growers, restaurants, local grocers, schools, and consumers. "And of course, Alice Waters and CASFS have long insisted that our food should be grown in harmony with nature, based on sound agroecological principles, and with the strongest commitment to justice in our food systems," Press said. Waters is an "articulate, humble, and forceful voice, speaking out at a time of a huge rise in food corporatization," said Amanda Rieux, a 1998 CASFS apprentice and one of the early garden teachers at the Edible Schoolyard. "The perspective Alice lends to the world is that everything about food matters—where it comes from, how it is grown, the variety, the season—that carefully engaged and loving attention to what we put in our bodies." Rieux praised Waters for her strong emphasis on "educating the senses." Growing, preparing, and tasting good food is a great way for children to engage with the world in an experiential way, regardless of economic background, she said. "You can hone your senses and have a very rich life," said Rieux, who founded Mala'ai, a similar school garden/kitchen project at Waimea Middle School on the Big Island of Hawaii in 2005. Since Waters started out, terms like "organic" have gone from fringe to ultra-mainstream. This is encouraging, she said—though a little disarming at times. She finds it striking "that I am considered completely unusual," she said, even though, in her opinion, she's merely espousing "common sense." She said that the fact that she stands out as much as she does suggests that "fast-food culture has really become the way people think, and it has changed the whole world." But Waters is not at all hopeless about the future of good food in America. She is excited about efforts such as the UC Global Food Initiative, which aims to put UC campuses, the state, and the world on a pathway to sustainably and nutritiously feed themselves. But the battle, she said, must be fought early on, and in the public school system, where children can learn to appreciate and grow high-quality food. She is already doing this with her Edible Schoolyard Project, in which students at Martin Luther King Jr. Middle School in Berkeley use a one-acre organic garden and "kitchen classroom" to learn every aspect of growing, harvesting, and cooking seasonal vegetables and fruit. "We have to learn about farming when we're little, not when we're graduates," she said. "It's in our DNA to love nature, and it doesn't take long for children to feel connected to the natural world and the cycle of planting, growing, and eating healthful and delicious food," said Waters, who has vivid memories of eating tomato salad and strawberry compote that came straight from her parents' garden. It was a taste that drew her into the world of food and that, even now, reconnects her to the spirit of childhood. "If children grow something and cook it themselves, they will want to eat it," she said. "It's like falling in love."